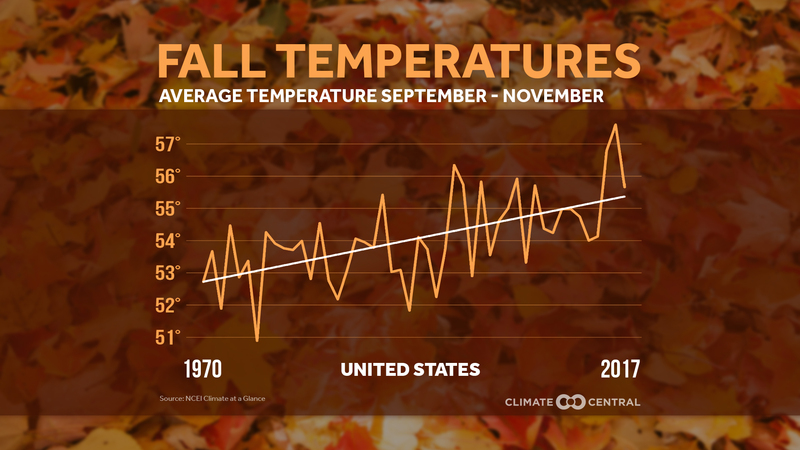 Fall is trending warmer in the U.S., which can affect fall foliage and agriculture. Happy meteorological fall! This week, we examined the trends in average fall temperature across the U.S. Of the 244 cities analyzed, 80 percent have warmed at least 1°F in the last half-century, compared to only 1 percent which have cooled 1°F or more. 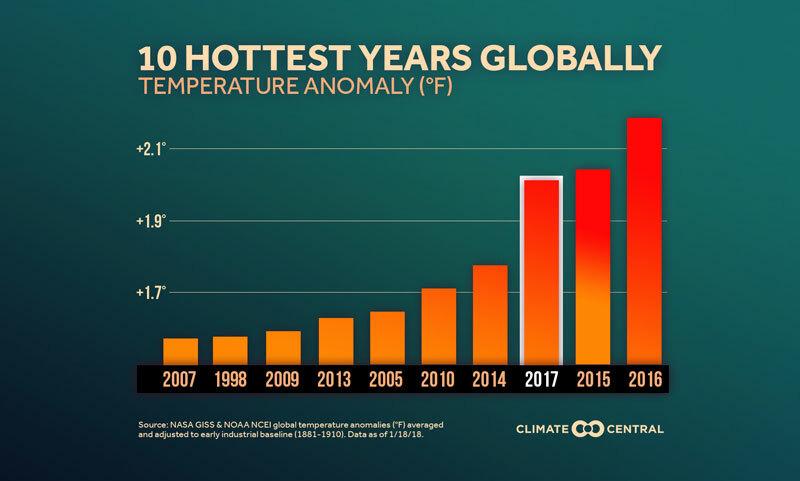 The warming has been especially pronounced recently, as the last three falls have been within the 10 warmest on record in the U.S., and the two warmest came in 2015 and 2016. 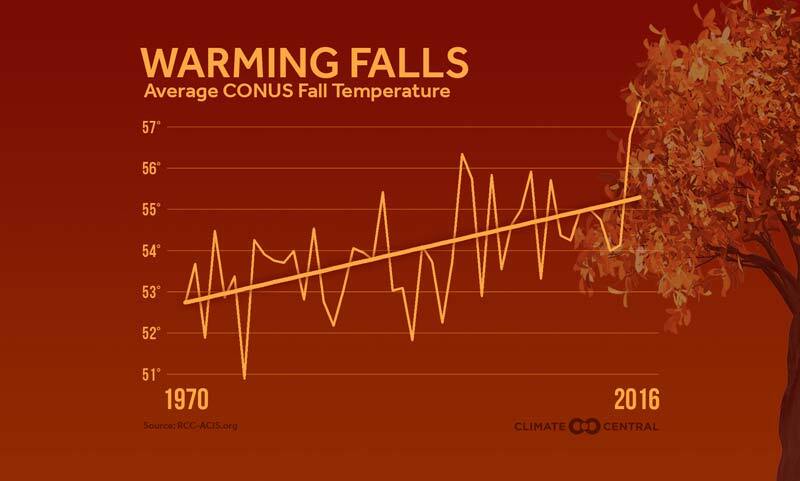 The warming climate effectively makes early fall an extension of summer, as the last characteristically hot day in most cities is also coming later in the year. While some will find that appealing, it means a delay in the return to cozy fall sweaters and hot chocolate in the evenings. 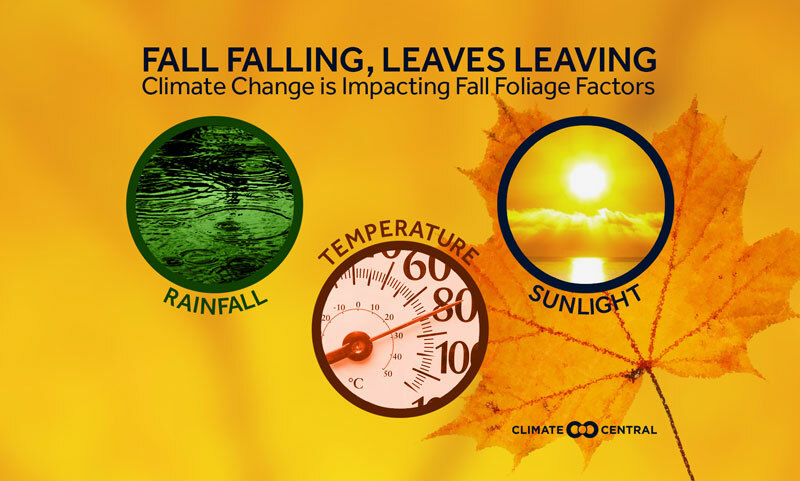 And in the future, climate change may delay the time of peak fall foliage and cause leaves to drop more quickly, shortening the foliage season. But it has more than just an aesthetic impact. Insects linger longer into the fall when the first freeze of the season comes later in the year. A new study from the Universities of Washington and Colorado indicates that for every degree (Celsius) of warming, global yields of corn, rice, and wheat would decline 10 to 25 percent from the increase in insects. 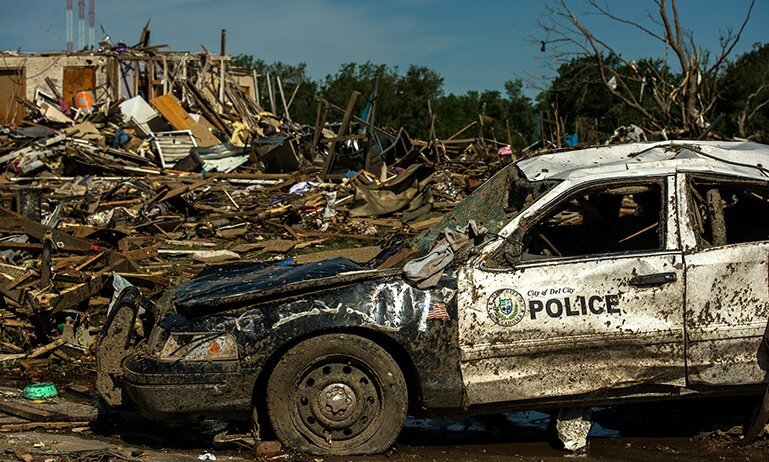 Those losses are expected to be worst in North America and Europe. 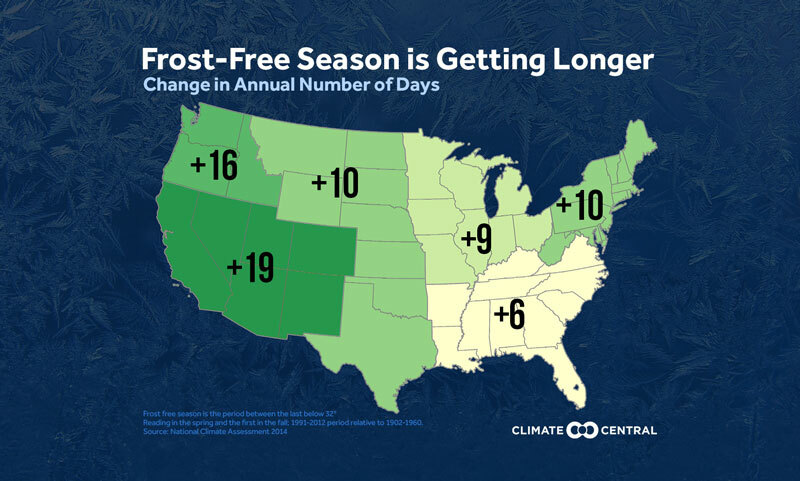 Plus, the extended summer means demand for air conditioning lasts longer into the fall. So those higher cooling bills will also last longer, which may cost you more than just an additional pumpkin spiced latte. Methodology: National trends in fall temperatures are from NOAA/NCEI Climate at a Glance for September through November. 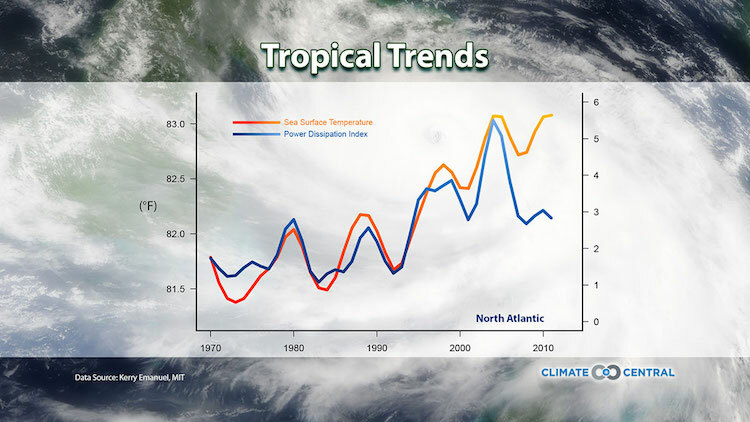 Individual city temperature trends are calculated using data from the Applied Climate Information System for the same period. Displayed trend lines on city analyses are based on a mathematical linear regression. More Warm Fall Days Across the U.S.